The Tamron 70-300mm f4-5.6 SP Di VC USD Lens offers unparalleled optical performance in a fast and steady telephoto zoom. Its advanced design features an LD (Low Dispersion) and an XLD (Extra Low Dispersion) lens element to help prevent chromatic aberration and provide sharp contrast. This is the first Tamron lens to be equipped with a USD (Ultrasonic Silent Drive), Tamron's very own ultrasonic auto-focus drive mechanism for faster focusing, making it a perfect telephoto zoom choice for photographing sports, wildlife, or other fast-moving subjects. In addition, Tamron's VC (Vibration Compensation) image stabilization assists hand-held photography, not only at long focal length ranges where blurring is common, but also under low-lit conditions. 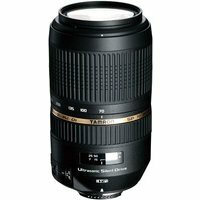 This combination of technology and quality optics makes the Tamron 70-300mm f4-5.6 SP Di VC USD Lens a premium telephoto zoom lens for both professional and enthusiast photographers.